Mr. Johnson tackles his subject with the skills of someone all too rare today — an investigative journalist. He is doing the job most “historians” won’t do. 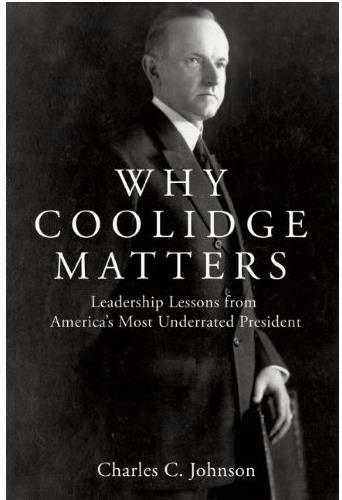 In a field of superb thinkers and diligent expositors of Coolidge, his work stands out as the best in recent years. Mr. Johnson’s work is not a simple recital of biographical trivia. Unlike most historians, Mr. Johnson delves into a study of Coolidge’s ideas and is equally an examination of statesmanship. While Ms. Shlaes has written a well-done treatment of debt and Coolidge’s approach to it, Mr. Johnson takes on the entire worldview of the man. In Ms. Shlaes’ book we see Coolidge as a very credible witness on economics. In Mr. Johnson’s book we see Coolidge as authoritative on the high calling of public service (chapter 1), the duties of self-government (chapter 2), the purpose of education (chapter 3), the Founder’s theory of government (chapter 4), the use of presidential powers (chapter 5), the shared nature of all people: race, immigration and women (chapter 6), a sensible foreign policy: mind our own affairs, conserve our strength and protect our citizens (chapter 7, p.224), and an Afterword containing Coolidge’s post-presidential wisdom, as he looked at current trends and drew from the often overlooked “obvious” essentials that can still guide us now. In “Why Coolidge Matters,” the way Coolidge thought and acted is brought into clearer relief as all part of one, complete whole. It is both a primer to Coolidge’s own words — of which there are many, including three books of his speeches — but also is an introduction to Coolidge’s comprehensive and consistent outlook. Mr. Johnson reminds us that President Coolidge is discounted today not because he never said or did anything but because what he teaches is the most powerful refutation of “modern” liberalism’s destructive legacy, from the schools to the inner cities to Washington itself. The man discounted for a lack of vision, saw where the mountain of bad policies covered by good intentions would lead long before later generations have. Coolidge is a force to be reckoned with and is marginalized at one’s peril. Perhaps the fear that what Coolidge has to say might break through the assembly line of untaught and unchallenged students who become uninformed and complacent citizens is why he is not welcome in many of our schools. Be ready not to simply scan through the book, but delve into the principles of the last classically-trained statesman-philosopher to serve in the White House. Be prepared to grapple with the problems he faced and how to comprehend the substance of the ideas he articulated. Be equal to the challenge of thinking the Founder’s thoughts, as Coolidge would say, to apply their timeless discoveries to what issues confront us now. You will be disappointed only if you refuse this challenge to think, to move past ignorant frames of reference and thereby begin to understand that the principles to which Coolidge directs our respectful attention — the things of the spirit, as he called them — build great and just societies. It is the Declaration and Constitution which gave birth to all our affluence and comfort, not the other way around. Before we can honestly discard the former two as obsolete or unworkable, we have to have tried them. Instead, it is time we start getting reacquainted with the ideas they contain and the sacrifice it requires of us to make them work.